Today is the day. 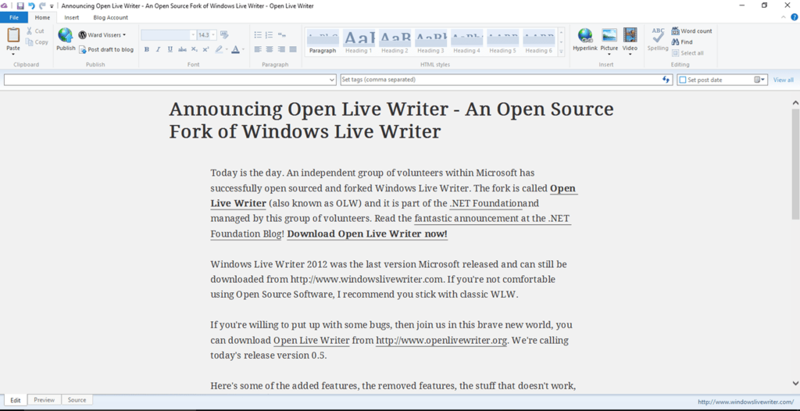 An independent group of volunteers within Microsoft has successfully open sourced and forked Windows Live Writer. The fork is called Open Live Writer (also known as OLW) and it is part of the .NET Foundationand managed by this group of volunteers. Read the fantastic announcement at the .NET Foundation Blog! Download Open Live Writer now! Windows Live Writer 2012 was the last version Microsoft released and can still be downloaded from http://www.windowslivewriter.com. If you’re not comfortable using Open Source Software, I recommend you stick with classic WLW. If you’re willing to put up with some bugs, then join us in this brave new world, you can download Open Live Writer from http://www.openlivewriter.org. We’re calling today’s release version 0.5. REMOVED: Spell Checking. The implementation was super old and used a 3rd party spell checker we didn’t have a license to include an open source release. Going forward we will add Spell Check using the built-in spell checker that was added in Windows 8. Open Live Writer on Windows 7 probably won’t have spell check. REMOVED: The Blog This API. It was a plugin to Internet Explorer and Firefox and was a mess of old COM stuff. REMOVED: The “Albums” feature. It uploaded photos to OneDrive but depended on a library that was packaged with Windows Live Mail and Live Messenger and we couldn’t easily get permission to distribute it in an open source project. ADDING VERY SOON: Google runs the excellent Blogger blog service. We’ve worked with the Blogger Team within Google on this project, and they’ve been kind enough to keep an older authentication endpoint running for many months while we work on Open Live Writer. Soon, Google and Blogger will finally shut down this older authentication system. Blogger will use the more modern OAuth 2 and Open Live Writer will be updated to support OAuth 2. Windows Live Writer will never support this new OAuth 2 authentication system, so if you use Blogger, you’ll need to use Open Live Writer. BROKEN/KNOWN ISSUES: We are actively working on supporting Plugins. We have an plan in place and we are looking for your feedback on the most popular plugins that you want brought over from the Windows Live Writer ecosystem. Our roadmap for the future is published here on GitHub. Now I want to manage my Exchange 2013 environment from the Windows 8 workstation, no Exchange tools are installed on the Windows 8 laptop. In a few simple steps you can open a remote PowerShell session to one of the Exchange Servers.